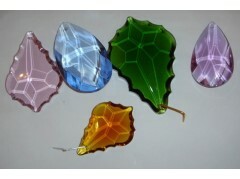 A selection of crystal colours. 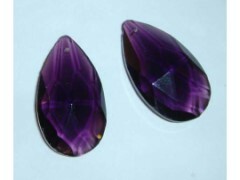 An example of a deeper coloured purple. 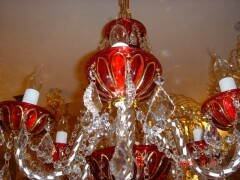 An example of a chandelier with red drip trays. One option for a red centre post, with silver highlights. 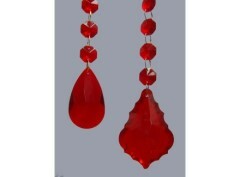 An example of a deeper red crystal. 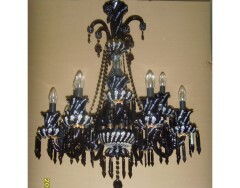 An example of a chandelier completely in black with silver highlights. 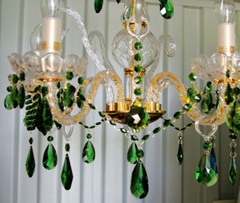 An example of a six light chandelier with green crystal drops and barley twist clear adornment. 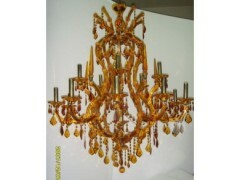 An example of a complete chandelier in amber including all crystal and framework. Clear lead crystal is a combination of silica and lead in varying concentrations. The higher the concentration of lead, the clearer the crystal will be, until the lead approaches 40% by weight, at which point the crystal starts to cloud. At higher concentrations of lead, it will turn white. By mixing in other elements, such as Iron, Copper, etc in varying concentrations, the crystal can be manufactured in different colours. In just the same was as with lead, varying the concentration of these elements can produce different density of colour. It is a very difficult thing to do with repeatable success. 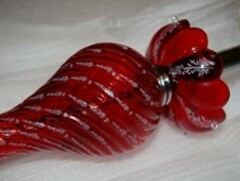 For this reason, coloured crystal is invariably more expensive than clear crystal. It can however produce chandeliers with stunning visual impact. We offer a full range of colour choices to our customers. Please telephone us on 0845 365 1 007 if you would like to discuss having your chandelier dressed in colour.